We love our pets and so why not have their food bowls match your personal style, and have your pet's name on them at the same time. Available in multiple designs, colors and fonts - so design two - one for food and one for water. Add the pet placemat, and now your pet is eating in style. 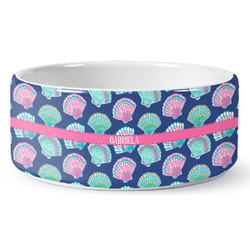 Our ceramic pet bowls are currently available in two sizes - Medium & Large. The medium is 6" in diameter and 2.5" tall and it holds 24 fl oz. This medium bowl is perfect for cats and smaller dogs - dogs who eat up to 2.5 cups of food per meal. The large bowl is 7" in diameter, 3" tall and holds 40 fl oz. It is perfect for medium to large dogs who eat up to 4.5 cups of food per meal. 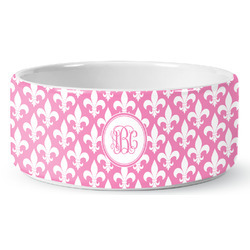 Our personalized ceramic pet bowls made from a fine quality, chip resistant stoneware. The ceramic is double glazed for beauty and durability. The bowl are easy to clean, dishwasher & microwave safe. This bowl came very quickly and look exactly like the picture on the web. It is a heavy bowl and doesn't slide around when my English Bulldog eats.